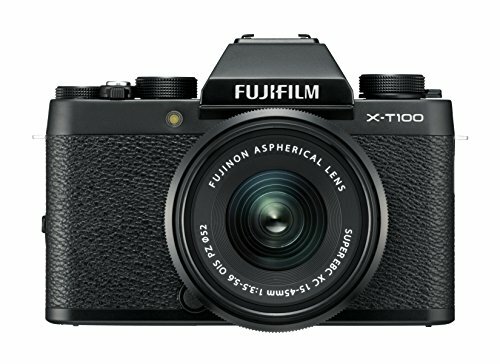 The Fujifilm X-T100 is a bit of an oddity in the Japanese company's mirrorless line-up: with its power zoom lens attached it functions differently to its X-series family, but not in a way that's particularly proficient for entry-level users, which sees it sit in a place that's neither here nor there. We've long been fans of Fujifilm's mirrorless cameras, so when the X-T100 was announced it got us scratching our head a bit: is there space in the X-series line-up for an entry-level model which does things a little differently to its bigger brothers? Power zoom lens attached to the front (it's electronically driven, just like what Sony has offered in its E-mount Alpha models for some time), we donned the X-T100 on a short trip to see whether it's up to task and logically fits into the Fuji range. First thing's first: the X-T100 is an interchangeable lens camera, in that different Fujifilm XF optics can attach to the front for a different view onto the world; some are ultra wide-angle, some longer zooms, many are fixed focal length primes with fast apertures. The power zoom that comes in the X-T100's box is a bit of an oddity: its 12-45mm range isn't far off the 24-70mm standard (it's about 23-68mm in old money terms), but with a limited maximum aperture (f/3.5-5.6) there's not as much control of light throughout this range as we'd like. Zoom all the way in, for example, and it's f/5.6 at best, which not only limits blurred background control, but in dim conditions means the camera has to amp up the signal to create a proper exposure, which can affect overall image quality. Furthermore this power zoom lens doesn't have a physical aperture ring like many of the other XF lenses out there. For an entry-level camera that doesn't necessarily matter, but as that hands-on, physical element of the Fujifilm ecosystem is lost, the X-T100 feels like an entirely different camera that's sandwiched somewhere between beginner and pro, but not targeted at either. Now this is, of course, all based on this lens. There's nothing to stop you from buying other optics for the camera to get yet more out of it, but if you're looking for that more traditional kind of control then, well, look to the X-T20 for just a little bit more cash. The camera with the smaller digits also has a better sensor, but more on that later. Elsewhere the X-T100 does come fully featured on the screen and viewfinder front. The fact is has the latter built-in will be as much an appealing element as it may be a deterrent for some others; it's a good finder, though, with ample resolution and helpful for when sunlight is too bright. The built-in LCD screen may look like a normal one, but it's built on a tri-adjustable bracket, which means it can be pulled away from the body for waist-level and over-head work in both portrait and landscape orientation. No other maker offers this kind of versatility, although we would rather a screen that could flip around on itself to be stowed to avoid scratches, as we find Fuji's hinge for the portrait orientation pull-out is a bit too fiddly. Top down the X-T100 has a smattering of dials: there's a Film Simulator to one side; a mode dial, exposure compensation and function (Fn) button to the other side, surrounding the shutter button. You can set these to Auto and fire away without making any adjustments, choose a pre-set shooting mode, or take full manual control of everything. The pre-set modes do feel a bit like a compact camera mode dial creeping into a more serious camera, though, and we don't think they fit into the mix especially well. There's no onus to using them, nor any great instruction about when and how they could be useful (there's a small description and image that appears on screen, such as "Landscape: for clear scenic shots", but that's all). Special modes excused for the time being, the X-T100 has what sounds like a capable autofocus system. With a total of 91 points dotted across the screen, it's possible to select one, an area/group, and move the focus area around using the touchscreen or other controls. Resizing the focus point is easily controlled by the rear thumb dial, whether you want a small crosshair or much larger area. Problem is, we've found the X-T100's autofocus to be the poorest performer on a Fujifilm X-series camera to date. Maybe it's the fault of the lens, maybe it's a mixture of factors, but we've not been getting the in-focus rate as we would expect from such a camera. A half depress of the shutter button will illuminate the focus area in green to confirm focus, but even then we've had some scenes - from moderately close-up flowers to farther-away buildings - be out of focus in the final shot. As you won't always see this on the small rear screen, that's resulted in some throw-away images, which is a shame. Continuous autofocus isn't up to much either, while the up-to 6fps burst shooting is fine but not the super-rapid form of other X-series cameras. Sport mode doesn't put the camera into either of these settings, for whatever reason, which is somewhat baffling. Now, when the X-T100 is on point with its focus - and, in fairness, it's taken plenty of good close-ups and wider-angle landscape shots in our hands - can create good-looking, sharp enough images. That power zoom lens isn't a patch on Fuji's prime optics by any means, but these could be considered for future purchase nonetheless. When it comes to image quality the X-T100 also does things differently from its X-series family. While the majority of Fuji's mirrorless cameras use what's known as an X-Trans CMOS sensor - which has a patented and unusual colour array over its top for sharper results - the X-T100 has a "normal" CMOS sensor with a normal colour array. In essence, this setup is more akin to its competitors, which, in some respects, sees the X-T100 miss out on one of Fujifilm's biggest unique sells. Does this make for bad images? Not at all. The X-T100 is capable in a number of areas, with the potential to be better still with the right lenses attached up front. For easy day-to-day shooting, the small-scale X-T100 will serve you fairly well and deliver high-resolution output. The thing that really stands-out from a camera with a large sensor such as this is how good image quality can be in low-light conditions. Despite the power zoom lens' limits with aperture control, we've been shooting indoors and the camera has handled limited light really well by pushing the ISO sensitivity up. Were, say, a phone camera to do the equivalent the images would undoubtedly become mushy, but with the X-T100 even ISO 3200 has a great clarity and presence, without colour appearing overly washed out. It's not totally perfect, though. In addition to the mis-focus issues we've highlighted, the X-T100's film modes can push colours too hard, while the lack of a particularly wide dynamic range is cause for blown skies and other such highlights. The ability to shoot raw files and make adjustments with its DR Auto (read: dynamic range auto) can help with pushing and pulling the balance of shadows and highlights. On the video front the X-T100 sells itself as having 4K capture in the bank, but with a paltry 15fps capture here it's not of much use. Full HD benefits from much smoother frame-rates, making this the more obvious choice. Furthermore, we found the autofocus system not to Fujifilm's usually high standard, with a number of mis-focuses in all conditions causing some problems with our results. The lack of proficient 4K shooting and a sensor which lacks that special something compared to the higher-end X-series cameras also sees it a step behind. With the right lens on the front and the right person behind the camera, the Fujifilm X-T100 houses plenty of potential. The screen and finder combination and styling befit the series, but we'd much rather spend that bit extra on an excellent X-T20 instead. The X-T100, on the other hand, is a rare misfire for a series that's otherwise typically excellent. If you're looking for that retro form then the company's X-T20 delivers with aplomb. Attach a better lens, make use of the better setup, and get in that Fujifilm groove. This is how it should be done.